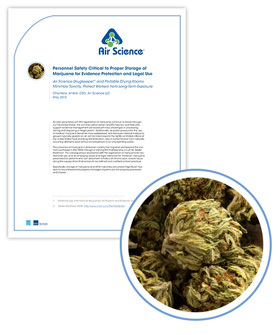 (Fort Myers, FL, August 18, 2015) Air Science has published a white paper outlining best practices associated with storage of marijuana and other narcotic evidence collected in forensic law enforcement. The white paper addresses issues associated with significant hazards that can occur when marijuana plants are not properly processed and stored in advance of court proceedings or other investigations where evidence is required. According to series of articles published in The Evidence Log, a newsletter of the International Association for Property and Evidence, Inc., (IAPE) any or a combination of mold, spores, yeasts and fungi can quickly turn marijuana plants into a toxic poison proven to compromise vital systems in humans and animals leading to illness and death. The white paper suggests that evidence rooms can become contaminated over time by Aspergillus, a mold which grows naturally on marijuana, dead leaves, compost piles and grain. Just as the clinical market has responded to the need to protect workers from the hazards associated with long-term exposure to cytotoxic agents, it can be argued that the forensic sciences and law enforcement community must take similar precautions in handling marijuana and other narcotics. Depending on the nature of the evidence, the criteria for defining hazardous drugs and how to handle them is universal. Air Science USA, LLC continues to develop solutions for forensic storage and processing as the requirement for evidence protection, together with personnel and environmental protection, remains in the chain of custody. Air Science USA, LLC has introduced a line of drug storage cabinets especially designed to isolate potentially toxic evidence such as marijuana. Marketed as the Drugkeeper™ and available in several sizes, this cabinet is useful for short-term storage of hazardous chemicals and other substances typically associated with drug investigations. Storage in the Drugkeeper minimizes health and environmental risks associated with handling chemical vapors and residues, VOCs and other materials associated with methamphetamine production, marijuana and other narcotics. For a copy of the white paper visit our website library. To learn more about the Air Science Drugkeeper line of carbon filtered forensic evidence storage cabinets and other products developed for forensic applications visit our online forensics products section.